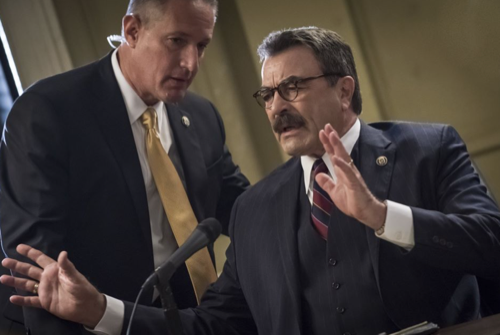 Tonight on CBS their hit drama starring Tom Selleck Blue Bloods airs with an all-new Friday, October 14, 2016, episode and we have your Blue Bloods recap below. On tonight’s Blue Blood Season 7 episode 4, Eddie (Vanessa Ray) and Jamie (Will Estes) observe a bad arrest; and Danny (Donnie Wahlberg) seeks a witness who will testify against a mob leader. Did you watch last week’s Blue Blood episode 3 where Danny and Baez are determined to get justice for a traumatized young woman who was held hostage, despite her resistance to press charges? If you missed it we have a full and detailed Blue Blood recap, right here! Unfortunately, the police were still having problems at the Bitterman Houses. The cops had apparently believed that once they removed the controlling gang out of the area that everyone else would finally learned to trust them however the people that lived in the Bitterman Houses actually came to blame them when several other gangs began fighting for control over that area. So the community still had a reason to be scared at night and a fear of retaliation kept many of them from talking to the cops. But so far no one likes what the police were doing to protect them because they said it went against their civil liberties. So the police were in a tight spot. They usually went into that type neighborhood prepared to cast a wide net over everyone that had given them probably cause whenever a crime was reported. However, the same neighborhood that there were trying to protect had thought the police were overreaching by arresting so many people and voiced their grievances at a town hall to Frank. Frank had tried reaching out to them and he had thought that he could convince them to finally work with the police rather than against them yet nothing had changed at the Bitter End and there had even been a shooting during the town hall. That time two people had gotten shot and still no one had wanted to come forward to say that they saw anything. So the case and simply investigating it was an uphill battle for Danny and Baez. The two wasn’t getting any cooperation and victims more often than not were also part of the problem. The detectives had had two victims though one of them died and the other swears that they were just a bystander who again didn’t see anything. Yet, just when the two were about to give up, one woman in particular had tried telling them that they weren’t going to have any luck because of the gang wars and she would have said more if someone had yelled at her from widow. Though Danny and Baez had wanted to know who that person was in the window that had tried calling the only person willing to talk to them a snitch and all that got was that the man was Fausto. So the detectives went into the building and they located Fausto, but it turns out Fausto had been left paralyzed by an incident years ago and so that made it a little difficult on Danny and Baez when they later arrested him. And they had to arrest him. Fausto had intimidated a witness that could have helped them solve a homicide and he had done in front everyone. Thereby ensuring that no one else would want to step forward. Fausto however didn’t care about getting arrested because he said that the police couldn’t make it stick and he was right. There was no way that the detectives could keep men like Fausto from expressing his free speech and technically what he said hadn’t been a threat against the young woman he was chastising. So Danny and Baez had thought that they weren’t going to get anywhere with Fausto and they were going to send him back on his merry way until Danny had found something. Danny had found out that Fausto had been second in command to a man named Eduardo Pozolero in Los Pozolero and that Eduardo had turn against Fausto for some reason. Eduardo had actually been the one that shot Fausto in the back and so his former boss was the reason why Fausto was now in his wheelchair. However, Fausto didn’t want to talk and apparently there was a condition that everyone in NYC was coming down with. It seems a police lieutenant could be attacked on the front lawn of his place and no one saw a thing though they were all pretty sure that the cop might have started it by taking out his gun. So Lieutenant Gormley who had been beaten so badly that couldn’t remember the event had also surprisingly been in the position of having to defend himself to his old friend Anthony. Anthony had agreed to do some leg work for what happened to Gormley because he knew people from that particular neighborhood and he had told Frank that they would be more willing to talk to him. Yet, he had needed to know for certain whether or not Gormley had taken out his gun to escalate the situation with a couple guys. So Gormley had told his friend that he didn’t think that he did because the gun had still been on him and in his holster no less when he had been taken to the hospital. And so the whole thing about the gun had simply been a way for people to lay blame on Gormley because they had been too afraid to tell the truth. So Anthony had gone to the only person in that neighborhood that he knew would tell him the truth. He had gone to his Aunt Sophia and, not that surprisingly, his aunt was still angry with him about a previous incident with his cousin. Anthony had apparently arrested his cousin Joey after his aunt had tried calling him for help with her son yet she refused to admit event to this day that Joey had been running cons on people and so she only agreed to help Anthony because he was her nephew. And so she told him about this new group of young man that have been running a ruckus through the neighborhood and then she told him that she couldn’t talk to her neighbors for him. Anthony’s aunt was just as much scared as everyone else and she didn’t want to drag her neighbors into something that could get them hurt. So Anthony then tried asking people around the neighborhood whether they saw anything and luckily he came across the group of hooligans on his own. The group that was seemingly trying to be a gang in suburbs was being led by a man named Vlad and Vlad was an ugly character. Vlad and his friends had moved into the neighborhood recently and overnight they were demanding money from local businesses, forcing people to sell them their homes on the cheap, and they had already shown that they weren’t scared of the police. Though Anthony hadn’t known who they were until Vlad got cocky and told him to his face that he and his friends own that neighborhood. So Anthony managed to find some dirt on Vlad and what he found was an outstanding warrant out on Vlad. Vlad had gotten caught for public urination so Anthony was able to bring him down to Erin’s office on that and there he had told Vlad that he had found other things as well. Anthony had also gotten the proof he needed that showed what Vlad was to doing to the neighborhood and that Vlad had chosen to turn on someone in his crew every time he had almost gone to prison. And so Vlad was willing to make another deal with the police. Fausto on the other hand had wanted to go to his grave without saying anything until Danny reached out to him. Danny had gone over to Fausto’s place with a lasagna because he knew that Fausto hadn’t had a home cooked meal in a while and the two of them had talked over dinner. Danny had told Fausto that Eduardo didn’t deserve his loyalty and that someone needed to stand in order to teach the younger generation not to be so frightened. So Fausto had agreed to testified against Eduardo, but when Danny came back with his partner, Eduardo had been in Fausto’s apartment and he said that he had reached an agreement with Fausto. The two detectives, though, had naturally accused Eduardo of threatening Fausto. Only Fausto said that it had been his own decision not to testify. He said that the police couldn’t protect him after he had stayed on in the neighborhood after turning on Eduardo and that it would just be better if he rejoined Eduardo’s crew. So Danny had tried to talk him out of it and he had practically begged Fausto to stand up against punks like Eduardo. But Fausto had claimed that he was good and then later killed Eduardo in front of everyone in the courtyard as well as the two detectives. Fausto had said that the neighborhood needed a hero and that he had helped them in the best way he knew how. So Fausto had stood up for something although he didn’t do it the way Danny thought he would. However, Fausto had been creative and so had Jamie when he had been in his own predicament. Jamie and Eddie had been ordered by a commanding officer to make a bad arrest yet they knew it was wrong so Jamie had tried going to his father about it and then he had just done something about it. Jamie had contacted that same officer that demanded an Arab man be arrested because he had complained about his driving and Jamie had told that officer that he would have to be called into court to give evidence. And so that officer back down because he didn’t want anyone to know what he did. Yet, Frank who had told Jamie to let the courts handle everything had gone back to his son and had tried to make peace. He said he didn’t want to instill in Jamie that he should back down however he knew that there were going to be times that job was going to be hard for him. So he had said that what happened to Dell had been wrong and in his own way he had been proud about the way Jamie handled things without his interference.